I’m not dead!!! Honest!!! *Checks pulse* Oh, CRAP! Maybe I AM dead!! *Tries one more time to be sure* Whew… there it is. I was worried for a second. I was having a vision of having to be a zombie and eat brains; raw, no less. For the record, I am the one American left who has never, not even once, seen “The Walking Dead” or any of the popular zombie movies. What was that one??? 28 Days Later, I believe was the name? The idea of watching an hour or more of human beings eating each other just doesn’t do much of anything for me; other than make me a wee bit queasy. I’ll stick to reruns of The West Wing, M*A*S*H and Greys Anatomy, thankyouverymuch. Man, now that I’ve written that paragraph, how do I manage to gracefully segue from zombies and eating people to banana bread? Hmmm. I really am alive though. I apologize for the lengthy absence. I had the stomach flu, then I went through a few days of no inspiration, then the weather finally warmed up (boy, did it ever) and I had a ton of outside chores to do or oversee with my “Momma/Wife Whip” in hand. But I’m back. I had a bunch of bananas that I needed to use up before they morphed into sentient life forms (I may have been too late. I think I heard one whimper when I mushed it up). 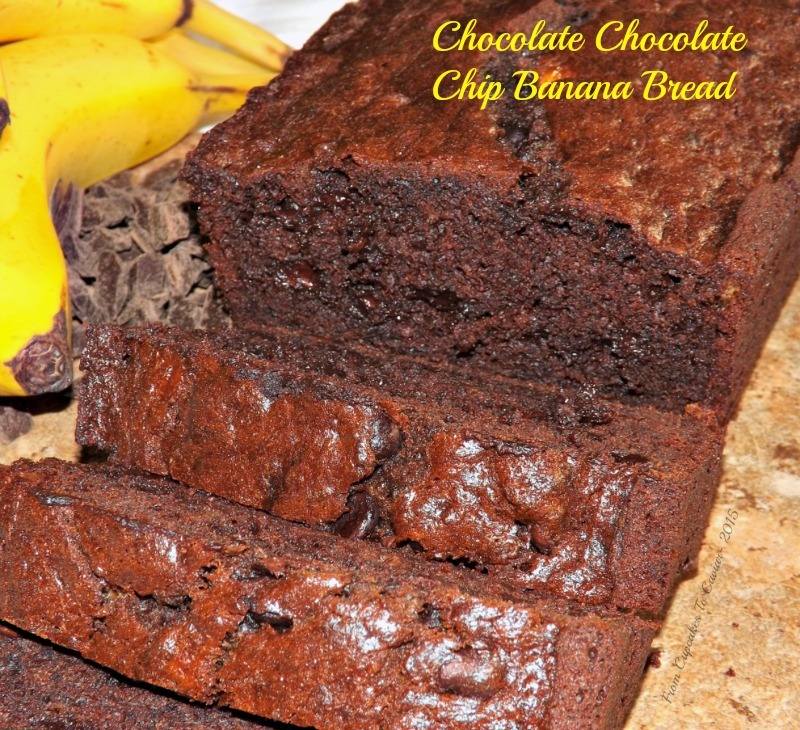 My husband has been wanting banana bread for a while, so I decided to redo my old chocolate chip banana bread post. I’ve been making this for years and put it up here early on in the blog and the pictures, of course, bit donkey toes. So a redo was called for so I could get this out there again. This bread is so darn good. Moist, banana-ey (yes, that is now a word. Because I said so. ), chocolatey, filled with chunks of melty, gooey chocolate chips. You want this. Your spouse wants this. Your kids want this. Your neighbors want this. Your…ok, I’ll stop now. Sorry. Preheat oven to 350. Grease 2 9 inch loaf pans. You can use 8 inch pans if you want a thicker loaf, but add on about 10 to 15 minutes more baking time. In a small bowl, whisk together the flour, cocoa powder, salt and baking soda. In a large bowl, cream the butter and sugar together until fluffy, about 3 minutes. Add the bananas and mix well. Mix in the eggs, vanilla extract and banana extract. Add the dry ingredients all at once to the wet ingredients and mix just until combined. Mix in the chocolate chips. Pour into the two prepared loaf pans and bake for 60 to 70 minutes or until a toothpick or skewer poked into the center of the loaf comes out almost clean. It’s ok if there are a few moist crumbs on it.. Let it cool for five minutes in the pan then turn it out onto a wire rack to finish cooling.